Zack Fryer details the vision of INEFFABLE. From Maplewood, New Jersey to the street style fits of hip-hop/rap artists, fashion brand INEFFABLE is on the rise. Created by fashion designer Zack Fryer, INEFFABLE fuses traditional patterns and fabrics with warm/cool colors to create contemporary pieces that radiate a versatile look. Jonathan Mckinnon: What makes you passionate about fashion design? Zack Fryer: There are really infinite possibilities with design. I enjoy fashion design specifically because I can wear creations. Clothing is universal, it has purpose. Tell our readers a bit about INEFFABLE. I started INEFFABLE in 8th grade. At the time, I was getting really interested in sneakers and fashion. Once I came to the realization that it wasn't cool to wear the same Polo and Jordan's that every kid at my school wore, I decided that the best way to have a truly unique piece of clothing was to design it myself. About a year later is when I started taking the brand seriously. I released my first collection and it picked up some traction. Since then, the brand has been growing at a steady rate. I have been working on it full-time since I graduated from high school in 2016. INEFFABLE means, "too great or extreme to be expressed or described in words." How does this meaning translate to your brand's representation in the fashion industry and among customers? Here and there, I'd like to believe that even as a small brand, INEFFABLE stirs up the streetwear industry. Not many small brands have access to the same manufacturing capabilities as the big dogs. Additionally, I think that INEFFABLE has played a role in creating certain trends. When larger brands feel threatened by an independent designer or company, they tend to talk down on them. With my brand, I want to make it so that there's not a term that can define it. It's not trash, it's not corny, it's just ineffable. Among my supporters, I want them to truly feel a part of something. As human beings, we are ineffable. When someone asks "where's that shirt from?" I can say "It's INEFFABLE." It's a double entendre. What elements of high-fashion and streetwear do you like to include when designing collection pieces? At this point, streetwear and high fashion have merged. When designing collection pieces, I really just design what I want to wear. I'm a streetwear kid. I wear a hoodie almost everyday. Most of my inspirations come from outside of fashion. With that said, I like the outside the box mentality of high fashion designers but I like the wearability of streetwear. I guess my goal when designing is to merge those two. Describe the marketing strategy and supply chain logistics needed in establishing a dedicated stockist as seen with INEFFABLE's two stockists in Japan and one in New Jersey. It's really tough to get stockists as a small brand. Buyer's want to purchase brands that they know will sell-thru with minimal effort. It's just like how a record label is much more likely to sign an artist that's currently blowing up opposed to someone you've never heard of. As an independent brand, I make sure I shoot attention-grabbing lookbooks, get important placements, etc. season after season so that stores have a way to market INEFFABLE to their customer base. I try to provide stores with ample content to post on their social media channels and even suggest how to merchandise the collection. Regarding supply chain logistics specifically for distribution and retail, for an upcoming collection, the first step is to create a timeline. This includes the timeframe for when you'll be accepting store orders, when you'll start manufacturing, when manufacturing will be completed and when the goods will be delivered/shipped to stores. From there, you need to open accounts with stores. After everything arrives from the manufacturer, you need to quickly sort through inventory and pack all of the store's order's so that they're sent out on the set ship date. There are a million moving parts but that's the gist of it. Recapping INEFFABLE's FW17 collection, what would you say helped inspire the chosen fabrics, colors and cuts? The overall inspiration for the collection was the style of the Japanese motorcycle gang "Bosozoku". You can see a lot of influence, specifically in the way the lookbook was styled and presented. That's how I came up with the Leather Moto Jacket. The back of the jacket was inspired by Marlboro's iconic color blocking. I had the cargo design for a while and decided to go with a thick nylon because it's a fabric you typically wouldn't see cargo pants made of. It's durable, has a nice shine to it and is super comfortable. I already had the flannel designed before the collection came together as well. I added the contrast stitch to it after designing the contrast stitch hoodie. I've always liked the look of contrast stitching. I did it a few seasons ago on the Reversible Jeans. It's something you see a lot day to day but it rarely looks cool (think of UFC hoodies). I wanted to change that. 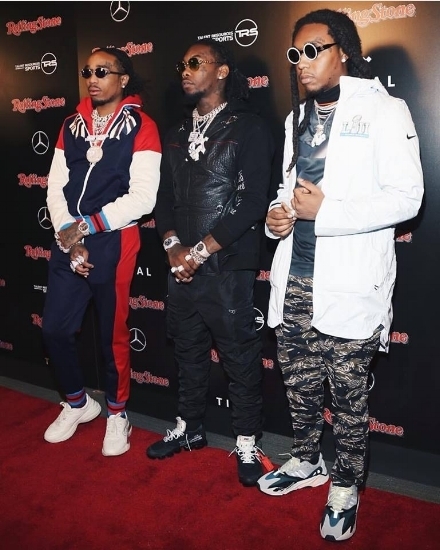 Offset from the Migos has taken well to INEFFABLE with him wearing the 'Leather Moto Jacket' and 'Bungee Cargo Pants' respectively at televised events. Take us through your initial reaction to Offset, and other music artists wearing INEFFABLE, and the after effect of your fashion brand receiving spotlight exposure. 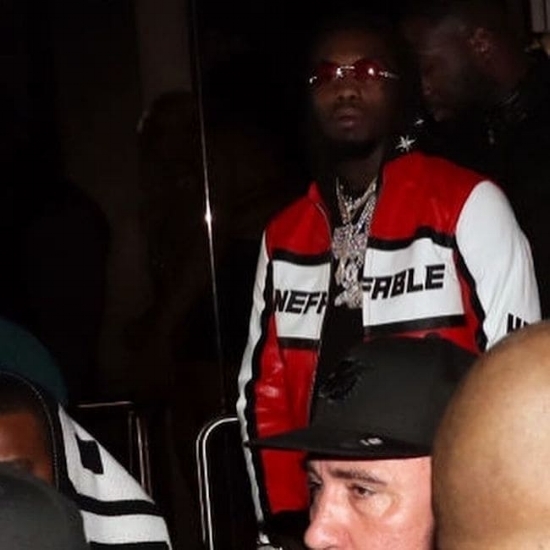 The first time Offset wore INEFFABLE was when he wore our first Patterned Flannel last year in a picture with the rest of Migos and Justin Bieber. He also performed in it later that night in OKC. Although I gave him the flannel in person, that was a month or two beforehand so it caught be by surprise. People started tagging the brand in the comments of the picture of him wearing it on Instagram and when I first saw it I was super geeked. Called my girlfriend, mom and my dad and then blasted the picture on the brand's social media channels. It was a huge look for me. I think the brand's Instagram gained like 500 followers that week without a tag from Offset and it helped move a design that was previously slept on. In this era of fashion, what are three essential attributes that American fashion brands must have to be successful? To last, I'd say unique designs and visuals, organic relationships and good business practices. Are there any fashion brand collaborations in the works? Not yet. I'm waiting for the right opportunity. I'd really like to build a core supporter base for INEFFABLE before I collaborate with other companies. With that said, I'm working on a collaboration with an Asian footwear company. Not too sure if it'll ever release. What type of INEFFABLE collection pieces can we expect to see this SS18/FW18? SS18 consists of Ripstop Tracksuits, Mesh Shorts with a matching top, a new colorway of our Split Flannel, a Patterned Corduroy Jacket and my favorite graphic tee to date. Can't get into specifics on FW18 yet, but the collection introduces knits to the brand's range which I'm really excited about. YouTube influencer Reggie Casual shares his insight on Japanese streetwear and thrift. The evolution of Flight 94, an emerging St. Louis streetwear brand. Meet John Dean, fashion designer of Renowned LA. Tyler Luke blends fine art with fashion. Salt & Lemon got us hooked, and soon you will be too.